My name is Kora, and I am a mature girl with a rather unique appearance — my tail doesn’t really match the rest of me! I am mostly white with a few orange markings, so my black calico tail really makes a statement. 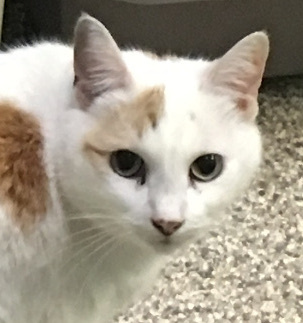 I am a pretty independent girl; while I enjoy the company of people and other easygoing cats, I also need my “me time.” I like to lounge in cuddle cups and kitty caves, peeking out and watching the world go by. I’m affectionate on my own terms, and I like to play with all kinds of toys. I could stand to lose a couple of pounds, but I am in good health and good spirits. If you seek a calm, independent companion, I could be the perfect addition to your family.